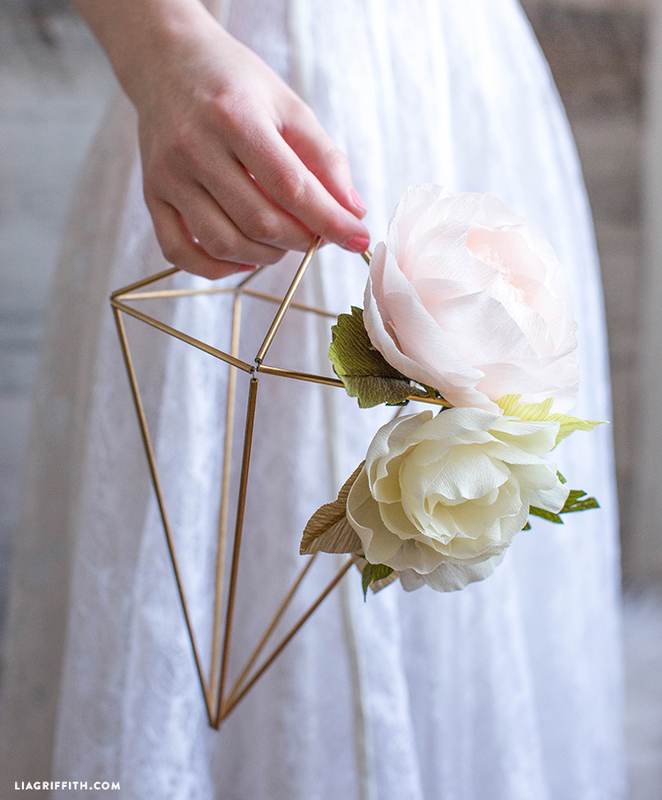 Geometric designs have been extremely popular in event and home decor over the last few years. The style is heavily influenced by Scandinavian design and the minimalist movement, mixed with metallic elements. 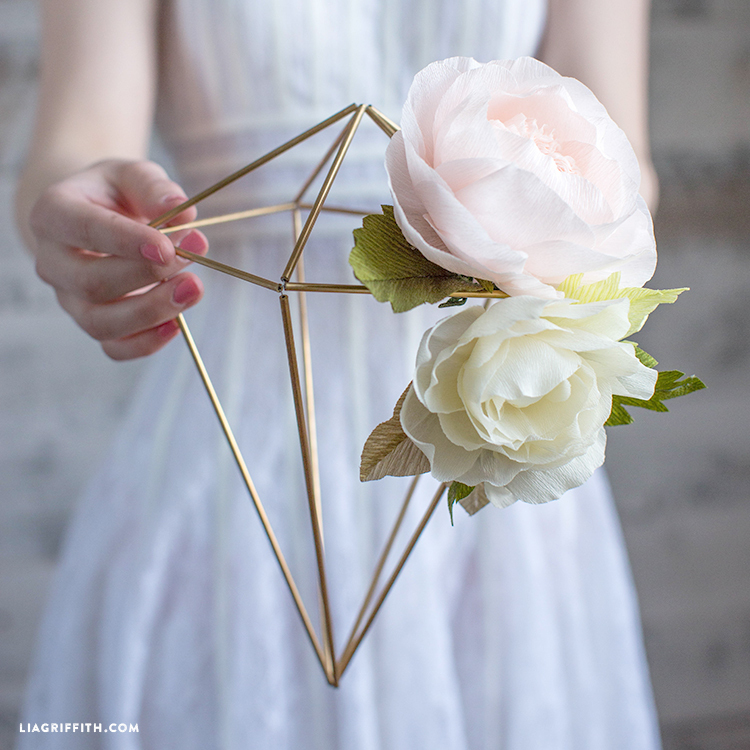 These basic metal structures are often referred to as himmeli when they are hanging in some way, but for this project we are using them as trendy DIY geometric centerpieces for wedding decor. You can find other tutorials for this design using painted straws and string, but for a more lasting and sturdy structure you should use metal tubing. Stringing these together is a super easy process, and once you finish you have lots of different options for decorating them. 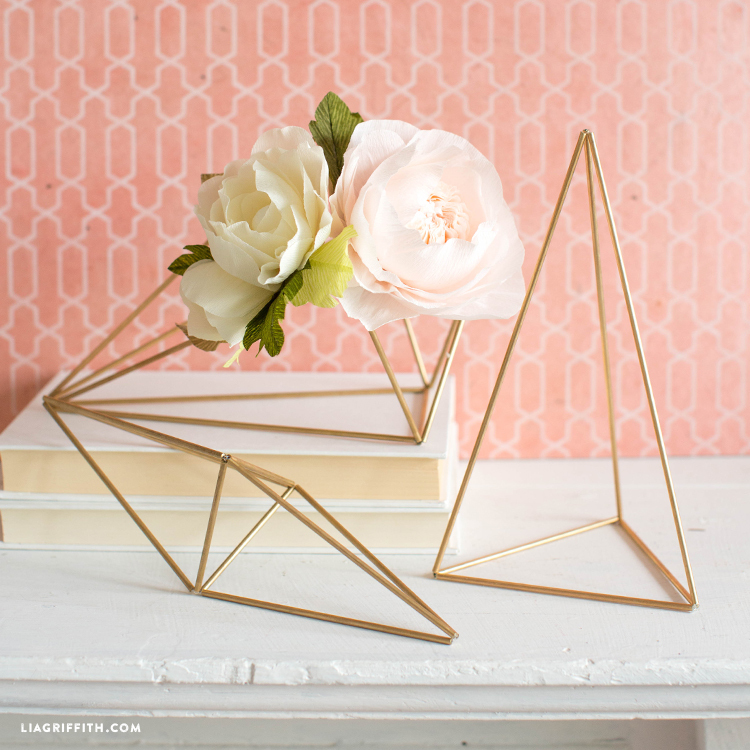 Secure the brass tubing to the edge of a table and cut six 5″ pieces and three 3″ pieces. Using a paper towel or an old rag, polish all of your brass pieces. Cut a 6-foot piece of fishing line. Thread one 3″ and then two 5″ brass pieces onto the fishing line. Leave an equal amount of fishing line on either side. Form a triangle with those three pieces and thread the fishing line back through the 3″ brass piece. Pull tight. Thread one 3″ piece onto either side of your triangle then one 5″ piece on the right hand side. Pull the 5″ brass piece up to form another triangle. Thread the fishing line down and through the adjacent brass piece. Thread the fishing line through the 3″ piece to the right and pull tight. String two 5″ brass pieces onto the left. Take those two 5″ brass pieces and form another triangle, this time facing down. Then thread the fishing line through the 3″ piece to the right. Add a 5″ brass piece to the line you were just working with. Pull it down and over to the point of the triangle next to it to form another, then thread the fishing line up and through the adjacent brass piece. Continue threading the fishing line through the 3″ brass piece to the left. Pull both ends of your fishing line up and together. Pull the fishing line tight and tie them together in a knot. Follow our centerpiece photo tutorial below for visual guidance as you craft! This is one of those projects where you can pick up almost all your materials at your local hardware store. 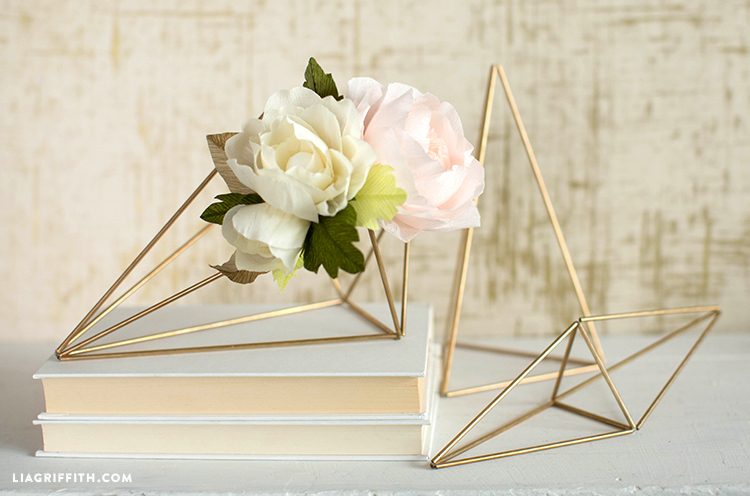 We used brass tubing for our DIY geometric centerpieces, but you can easily use copper tubing instead. If you want to match these to a particular color palette for your wedding, you can spray paint them for quick customizing. 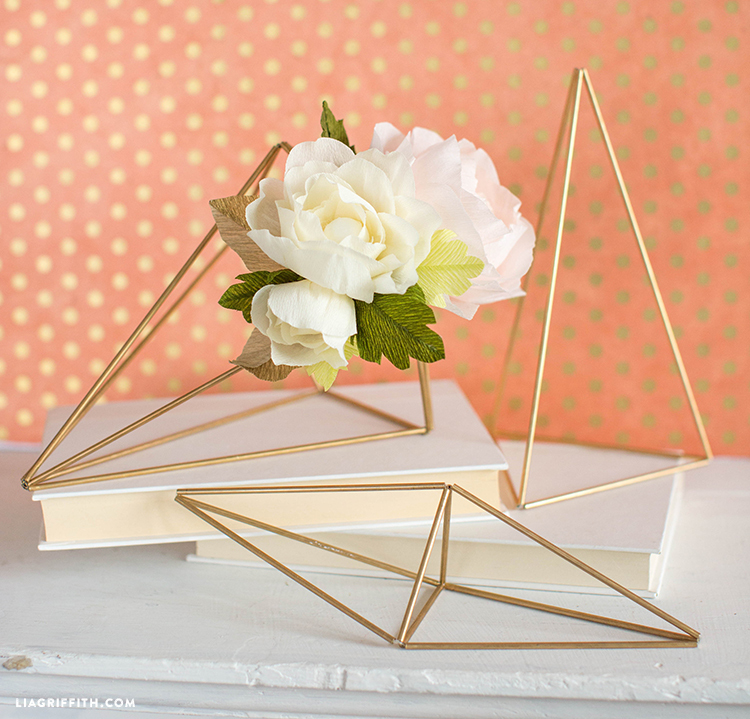 After tying the brass pieces together, we added some gorgeous paper flowers to turn the structure into a centerpiece. 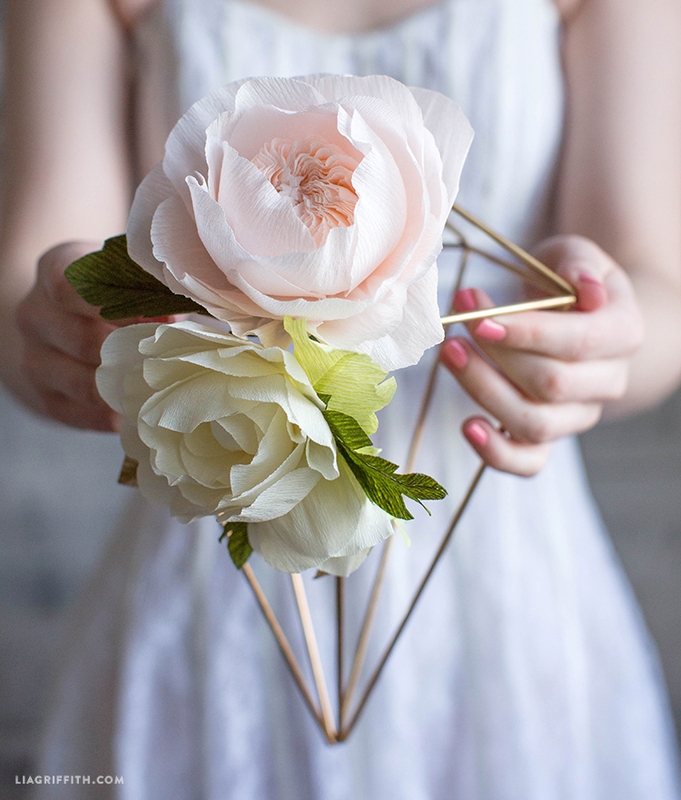 We specifically displayed a Juliet rose and simple white wedding flower in our centerpiece, but you can browse through all of our crepe paper flowers for inspiration. Another popular option is to add succulents like air plants into geometric decor. Hello! I love this for our DIY budget wedding! Wondering if you have the instructions for the diamond shape? Thanks!! Sorry Amber, we don’t! But you can follow the tutorial and just cut your tubing for the top half a bit shorter you’ll get the shape you want. Can you post the instructions for the vertical triangle and the diamond shape? Hi Clare! For the triangle, just stop at Step 9 and tie the ends. We’re working on adding instructions for the other shapes. I cannot find brass tubing anywhere, can you provide a link? My hardware store only had copper. Also, a link for the tube cutter would be great. Hi Meg! We purchased the tubing on Amazon but it’s no longer available there, but I did find it here! This is the tube cutter. Where are the instructions for the verticle triangle and diamond shapes? I was unable to complete this project with 4 feet of fishing line. I had to adjust the measurement to 6 feet. Thank you for letting us know, that was a typo!